The governor of the People’s Bank of China (PBoC) gave an unprecedented warning last Thursday. Dr. Zhou Xiaochuan warned that the Chinese economy could face a ’Minsky moment’ in the near future, if China allows tensions to build up in the financial system any further. This is the strongest signal of a possible policy change in China till to date. What is a ’Minsky moment’? It is a situation, where asset valuations suddenly start to lose value en masse. Technically, it can be described as a sudden jump of the distribution of the asset yields into the negative. But, how does one get there, that is, in the ”jump”? Hyman Minsky defined the capitalist financial system to consist on three phases: Hedge, Speculative and Ponzi. In Hedge, most of the economic units (households, investors and firms) are able to finance all their payment obligations with their cash flows. In Speculative, most of the economic units are able to handle their financial commitment, but not to repay the principal out of the income flow. In Ponzi, most of the units are able to finance neither the principal nor the interest of their debts from their cash flows. The ”jump” in asset values occurs when the economy reaches the end of the Ponzi. In Ponzi, economic units are only able to meet their obligations as long as asset appreciate in price. When assets start to depreciate, economic units default or enter into bankruptcy and suddenly the whole asset universe starts to lose value. This is the ’Minsky moment’, first formalized by Paul McCulley after the Asian crisis. As the leading financial authority, PBoC, warned that China might approaching such a moment, where does this leave us, the world? Like we have been touting since March, China is the only country keeping the global recovery story going (in addition to the central banks, of course). If the asset value destruction starts, and the ”jump” happens in China, it will be followed by debt destruction or deflation. 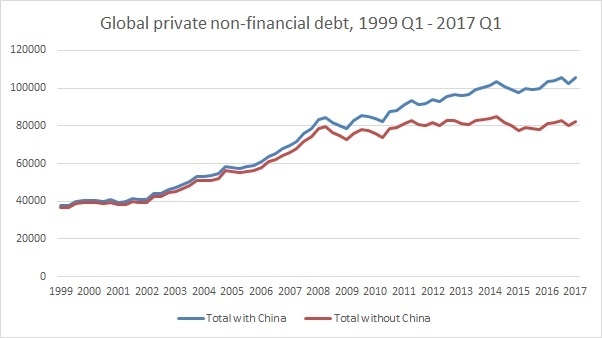 Because China has been responsible for over 95 % of global private debt creation since 2008 (see the figure below), global private debt will start to contract (unless other large economies and corporations commence a massive investment spree, which is unlikely). This China-induced global debt deflation will mean a global asset deflation, and thus a global ’Minsky moment’. So, if China faces a Minsky moment, the world, with high probability, will face it also. Non-financial debt of the private sector in 44 major countries. In billions of US dollars. Source: GnS Economics, BIS. When the leading financial authority of a somewhat authoritarian country that has driven the global economy for the last nine years warns about the possibility of a sudden reversal in the fortunes of the asset market, everybody should pay attention. Most importantly, everyone should start asking, how are they going to survive from the looming global asset bloodbath?